You are at:Home»Reader Questions»How Do I Get An 800 Number For My Business On The Cheap? How Do I Get An 800 Number For My Business On The Cheap? Update – How Do I Get A Custom Vanity Toll Free Number For My Business? What’s The Best Way To Get An 800 Number For A Craigslist Business? Hi Matt, I need an 800 number for a side business I’m starting, since I don’t want customers to see my real number or personal caller id. I don’t have a lot of money to spend, but what providers do you recommend that will let me add a 1-800 number to my Verizon cell phone inexpensively? I have some recommendations for you, but most importantly, you didn’t mention if you’re going to have an office or not? When I mentioned above whether or not you’re going to have an office, I was referring to the equipment and need (or lack of the need) for a phone adapter later on down the road if you decide to lease a space. This is something I talk a lot about here on Clever Leverage, is the main deciding factor for me when people ask about whether they should go with Grasshopper, RingCentral, or Phone.com. 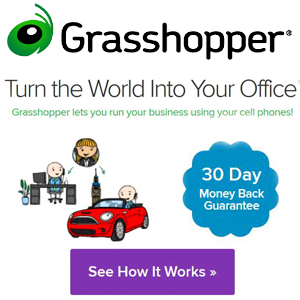 The cliff notes are, if you’re starting a business and just want a cheap toll free number on your cell, go with Grasshopper. It’s no contract, and you can always upgrade later. On the other hand, if you’re going to lease a retail or warehouse space, and want to have a physical phone there, go with Phone.com. They will let you add hardware without having to use any VOIP or WIFI adapters, and everything will work seamlessly. The next thing is what type of mobile device you plan on using… If it’s an Apple or Android, I don’t see any issue at all, but with some other no name brands you might have trouble finding a company that has the smartphone app integrated. Any of the carriers will work fine, and it doesn’t matter what cell phone provider you have… All three of the companies I recommended above have a free smartphone app for their toll free number customers. This will let you take and make calls from your cell phone, but no one will ever know since it displays your toll free business line, and works with any cell phone service. I know some of you want to get a number that matches your business name, or at least a brandable vanity 800 number that’s easier to remember than just a random string of numbers. This guide here will show you how to do an available number search, and this list here will have a couple other 800 number providers that have premium vanity numbers for lease. Someone else asked about selling yard services on Craigslist, and not wanting to list their personal cell phone number but wanted it to be memorable instead of just using a randomly generated Google Voice number. I can understand 100% here, and I wouldn’t want to use my number to advertise with either! As far as recommendations, they are the same as above… I’d start out with Grasshopper, and consider Phone.com if that’s more up your alley. Either one will work awesome, and I’ve used both successfully. How Do I Know Which VOIP Service Is Right For My Business? Which Company Has The Cheapest 800 Numbers For Startups? Which Virtual Phone Service Is Best For Larger Multi-Line Businesses?